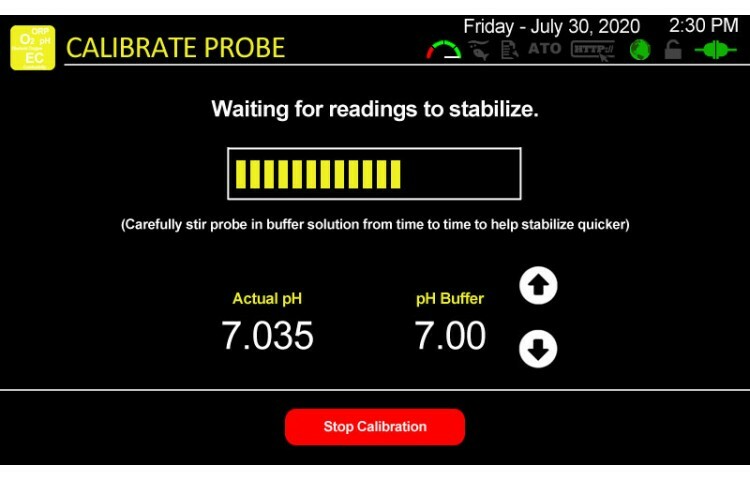 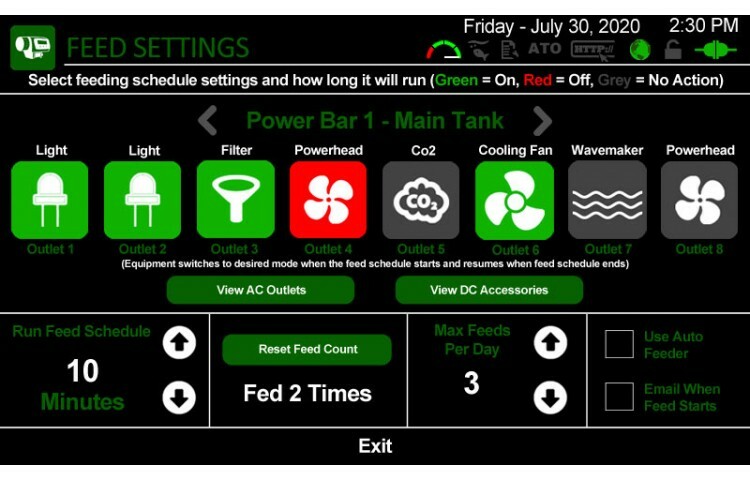 Robo-Tank is the fastest, and easiest to use DIY aquarium controller available for freshwater, saltwater or reef tanks. 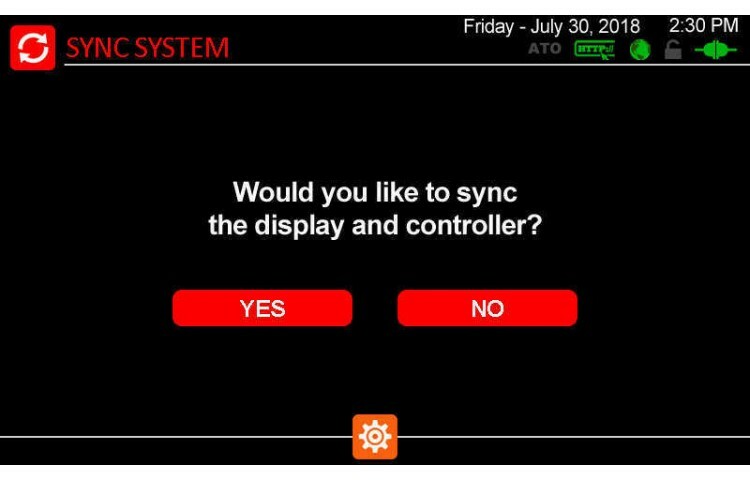 The controller gets its lightning speed using two 32-bit microcontrollers, one for the display and one for the actual controller. 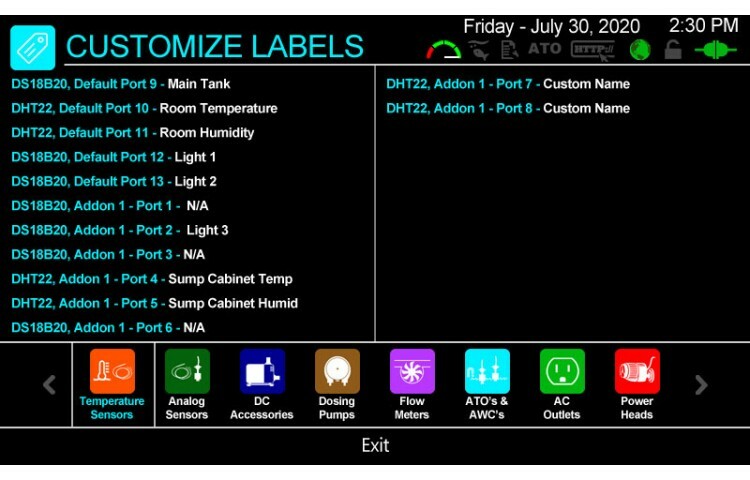 The controller is packed with many features including advanced scheduling, custom rules to control any equipment how you vision, auto-ranging graphs, 60 selectable icons for AC outlets and DC accessories, full customization with custom labels and much much more giving you the ultimate control for any size reef tank, freshwater or saltwater aquarium, your fish will love you for it. 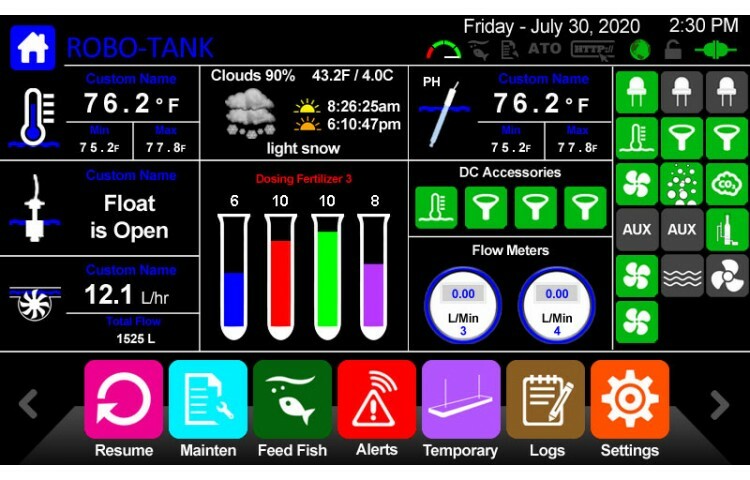 Robo-Tank comes complete with a full color 7" touch screen giving you an experience you enjoy while setting up your aquarium, no messy programming required as the user interface is intivitive and friendly to use. 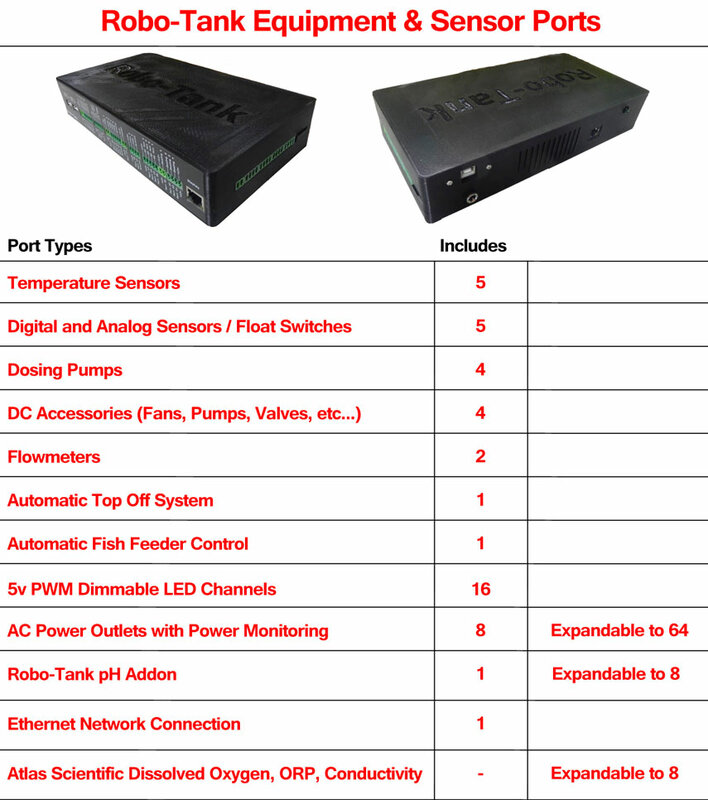 The display can be placed up to 100 feet away from the aquarium controller using a single Ethernet patch cable so you have a clean installation. 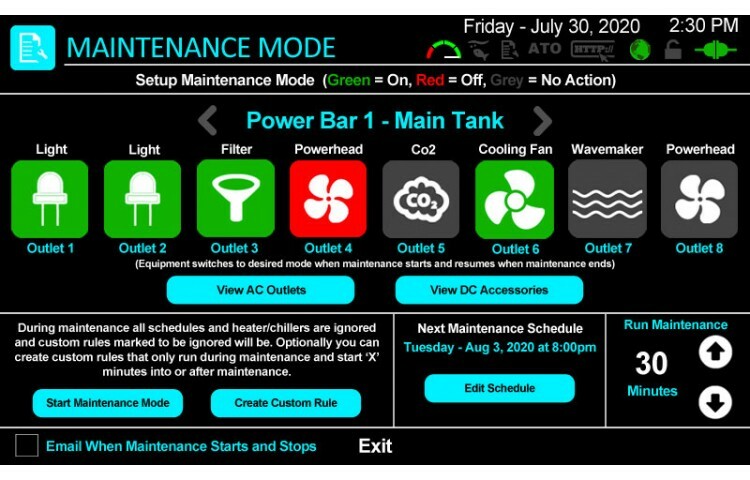 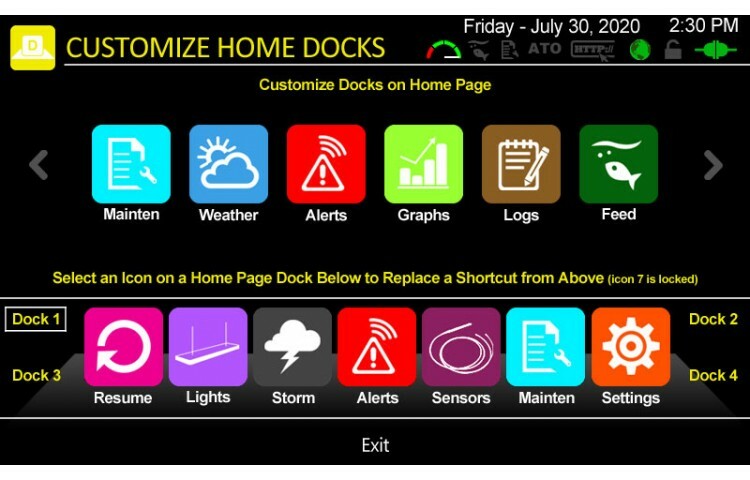 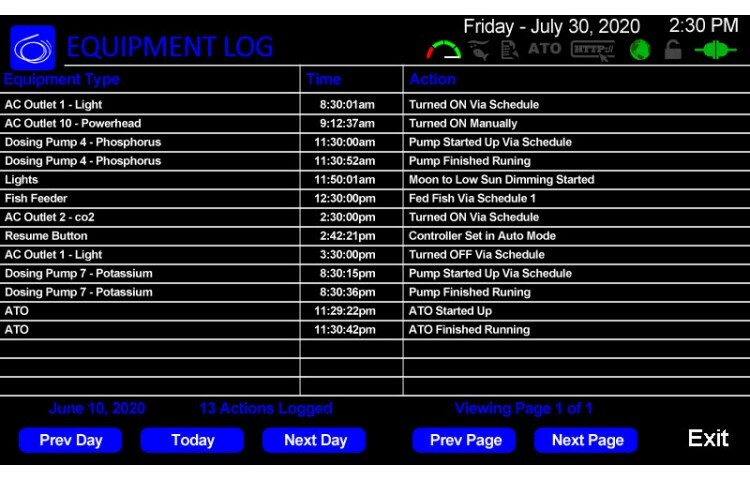 Robo-Tank has the features to control all the equipment on your freshwater or saltwater aquarium. 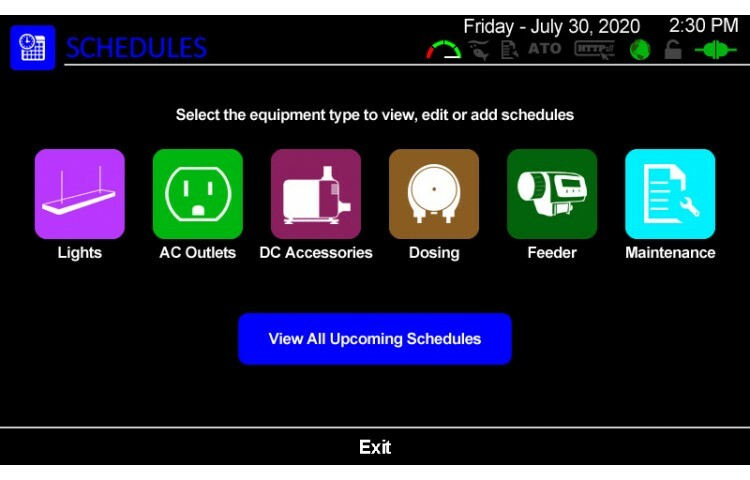 You can control 64 AC power outlets, run up to 16 channels of LED's using 12-bit resolution, 4 dosing pumps, 5 temperature sensors, 5 analog sensors, an automatic fish fisher, basic Internet control, 2 flow meters, email alerts, an automatic top off system, 4 DC accessories, Exacto™ circuits and if that isn't enough you can grow your Robo-Tank controller giving you more control. 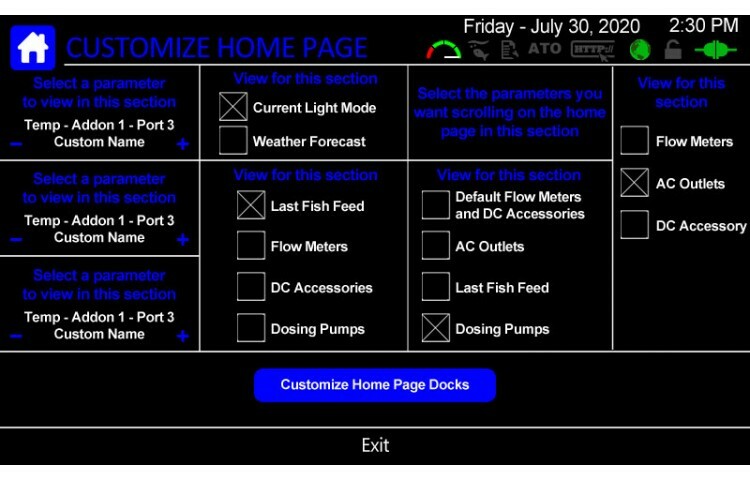 Look back on your aquarium using graphs. 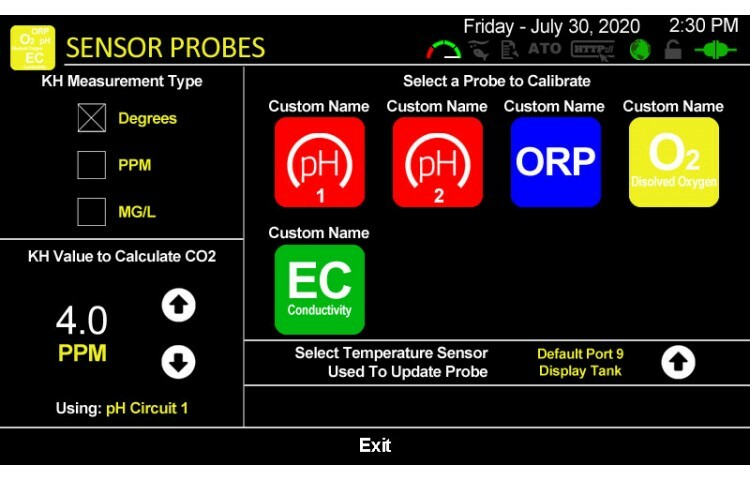 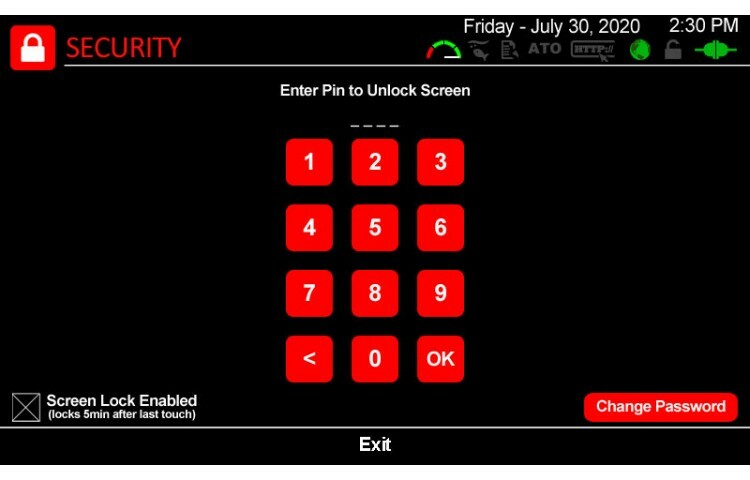 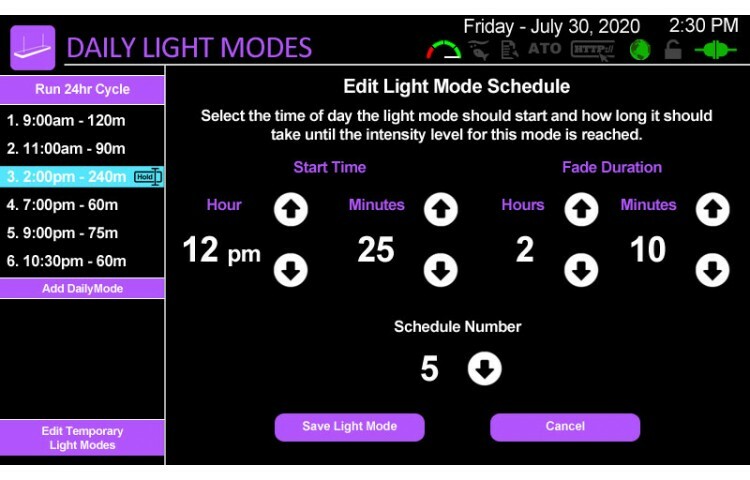 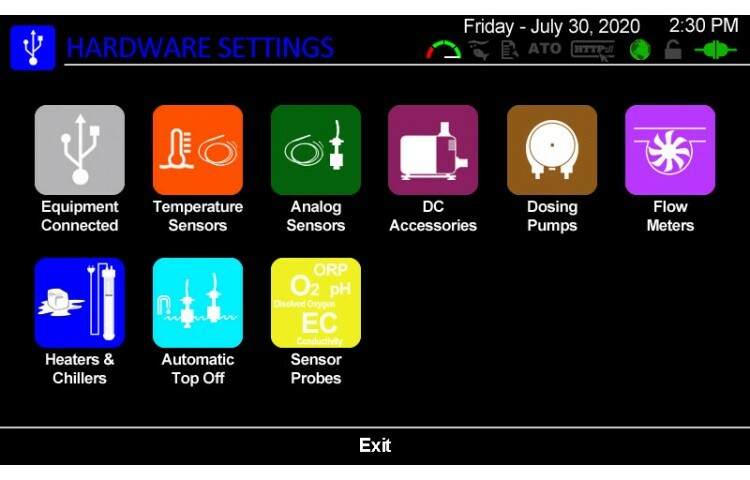 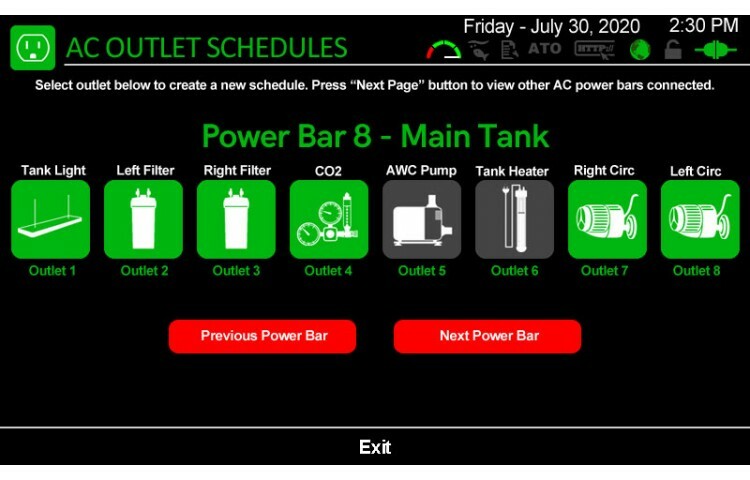 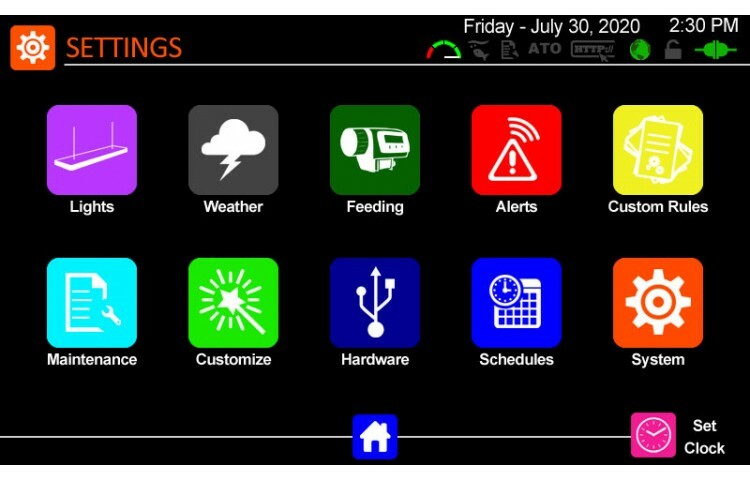 The controller logs all of the sensors connected (18) allowing you to view each of them in a day, week, bi-weekly or monthly format. 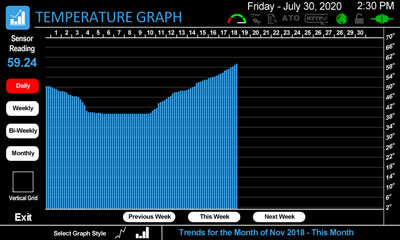 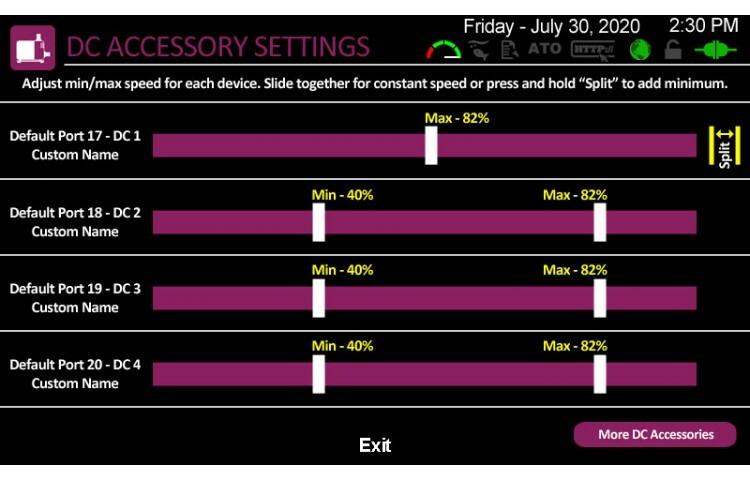 You can switch between a bar graph and line graph and easily navigate through the days. 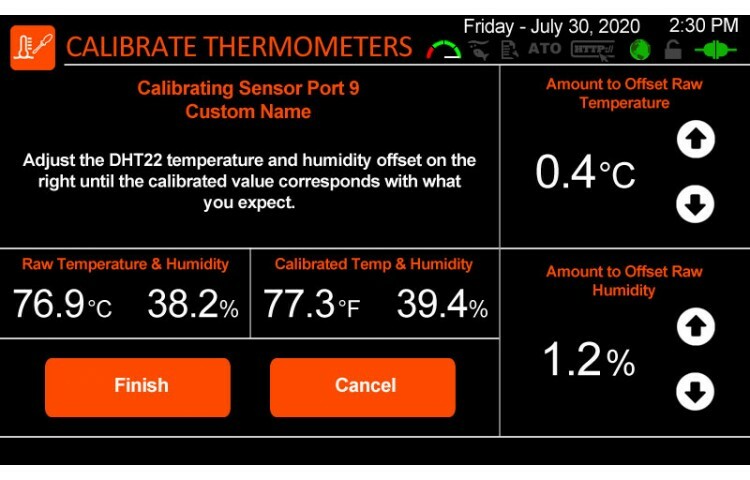 The current day or range of days being viewed is displayed at the bottom so you always know what you're looking at, the current sensor value is also displayed. 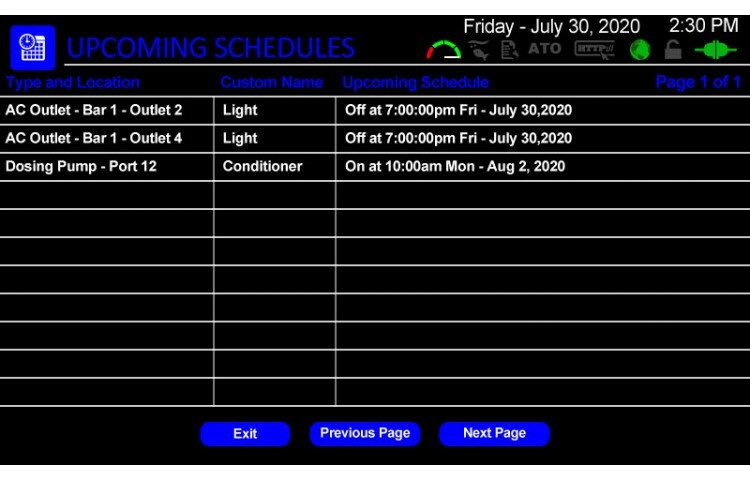 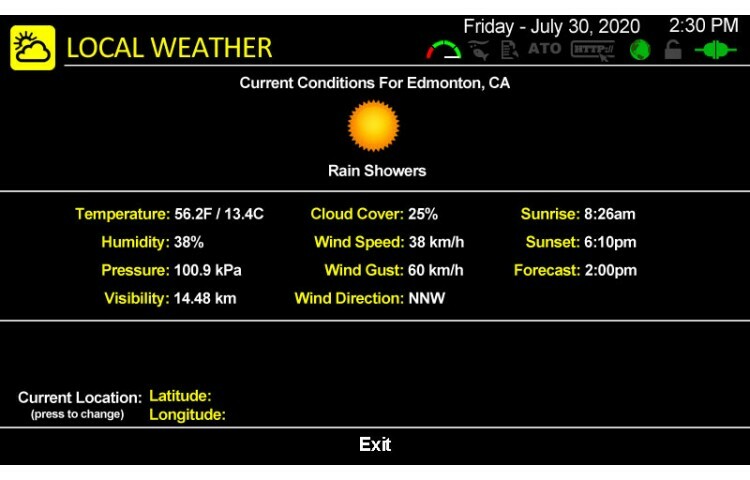 You can also turn on an optional vertical grid so you get a better look and the colors on the graph match the button on the menu. 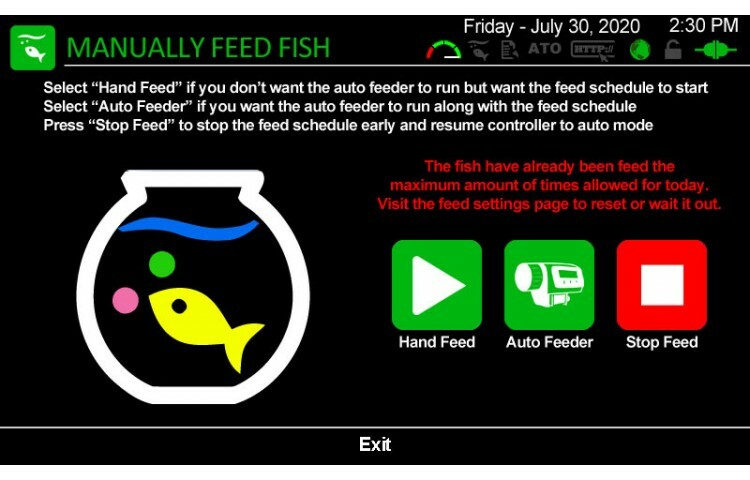 All the graphs have an auto-range feature, this finds the minimum and maximum value for the data being viewed on your aquarium and draws the graph based on that. 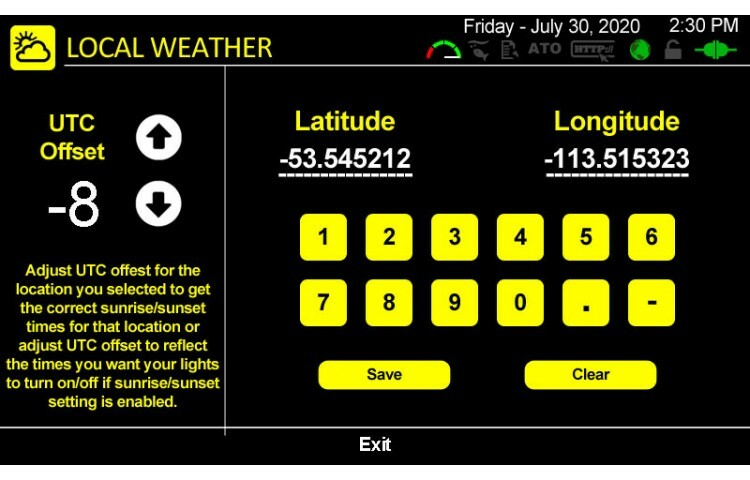 Any value from 0.00 to 100000 will work. 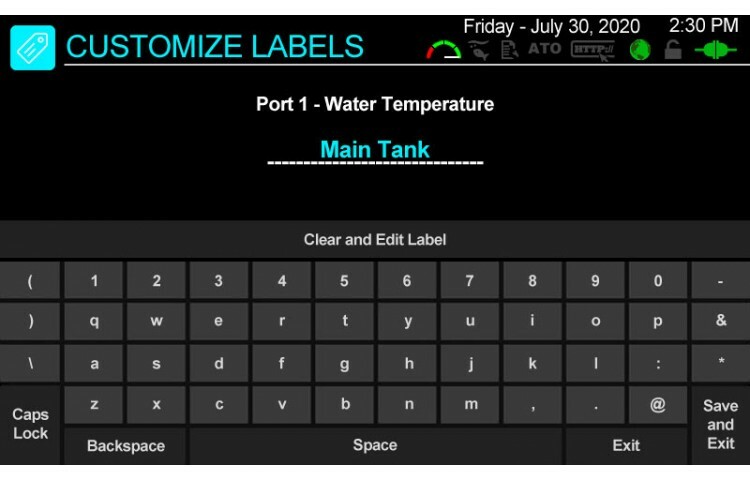 The labels for the vertical axis are generated based on this. 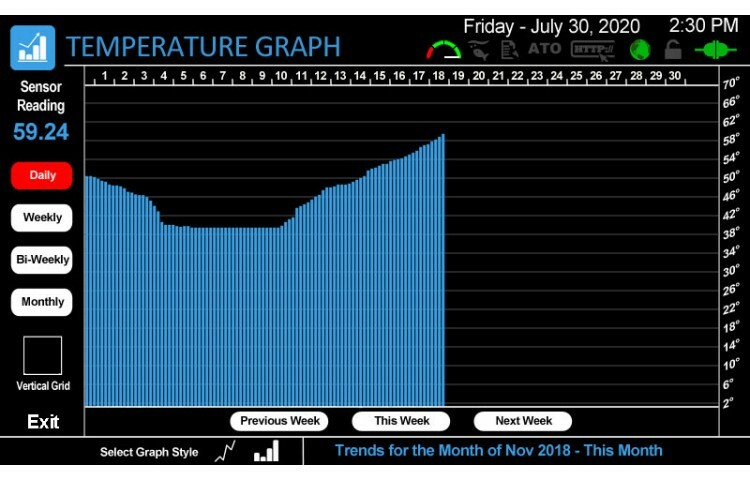 You can also zoom in and out of the graph. 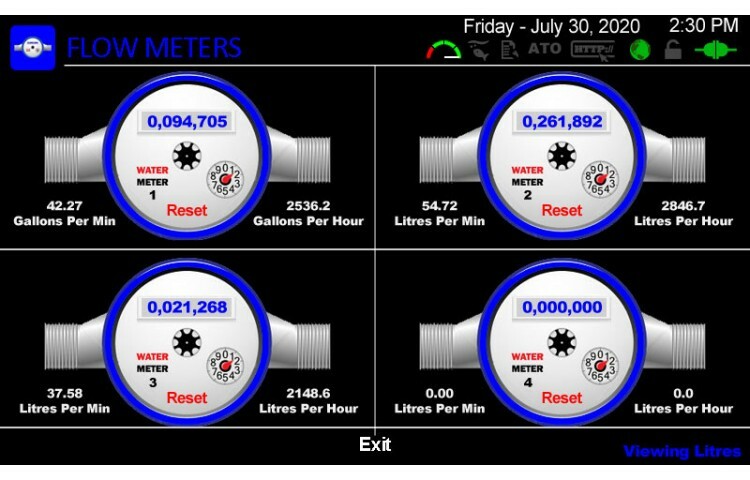 Each of the sensors data is logged every 8.5 minutes, all the data goes on the SD card. 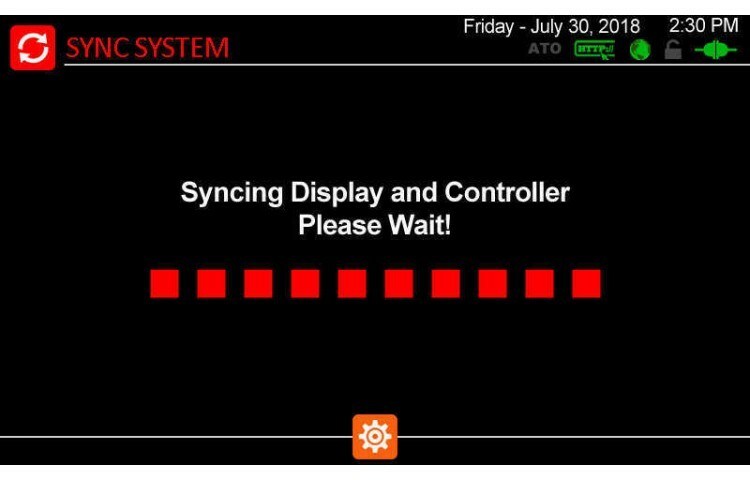 There's no limit how much data is stored on the controller and the display is setup to look back 10 years in time. 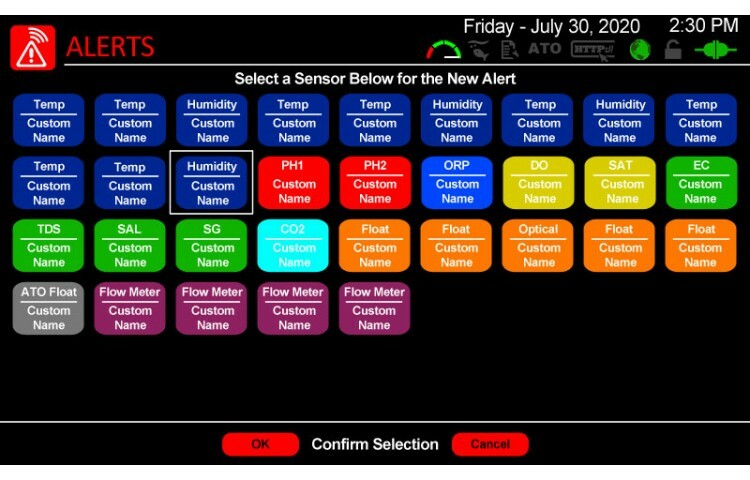 Each day's data for the sensor is stored in a seperate file, the name is the date the file was created so its easy to go through the files and pick out certain days. 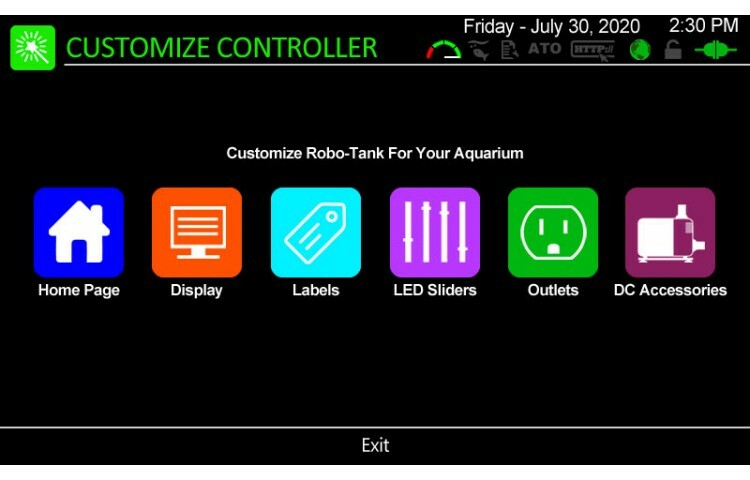 Unlock Robo-Tanks full potential using custom rules, with these you can achieve almost anything using this aquarium controller. 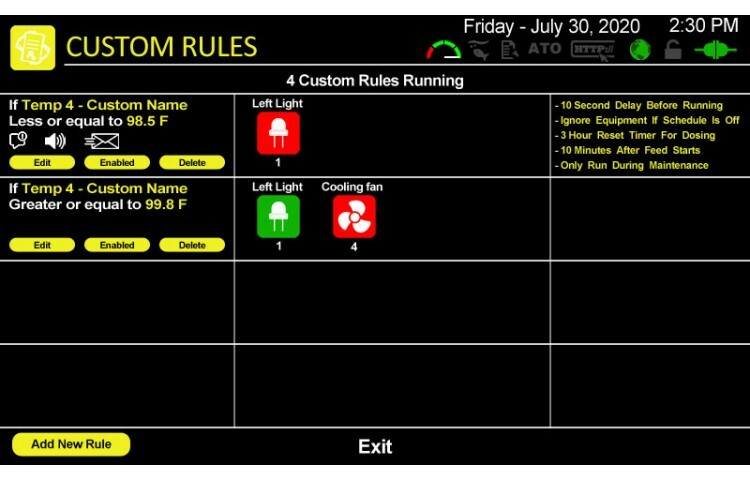 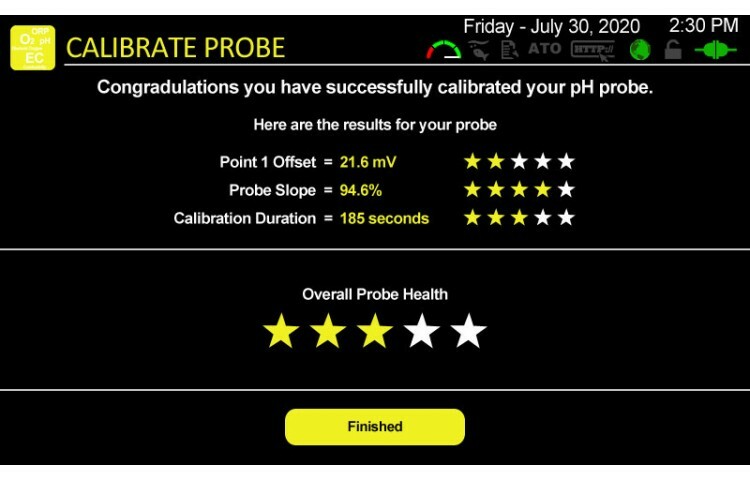 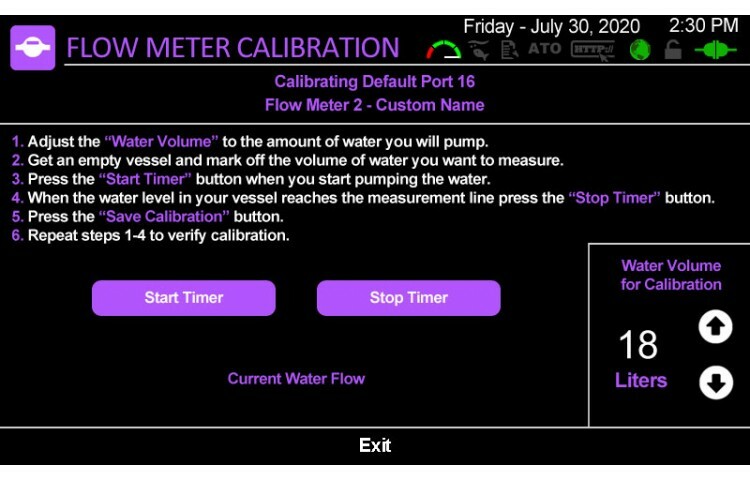 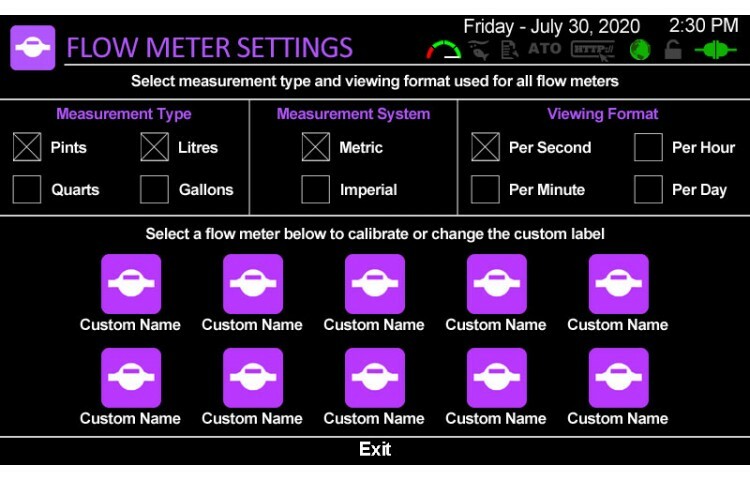 You can easily create up to 30 rules using any of the 18 parameters the controller reads, 5 accessory sensor ports or the 4 flow meters. 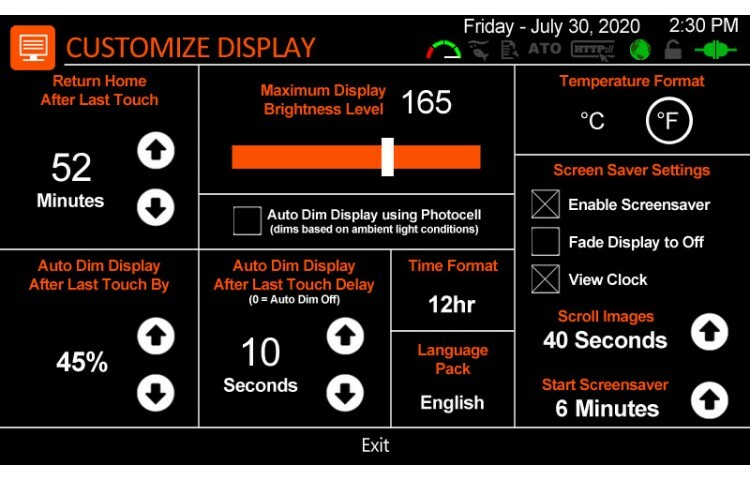 No programming is required, simply touch you're way through. 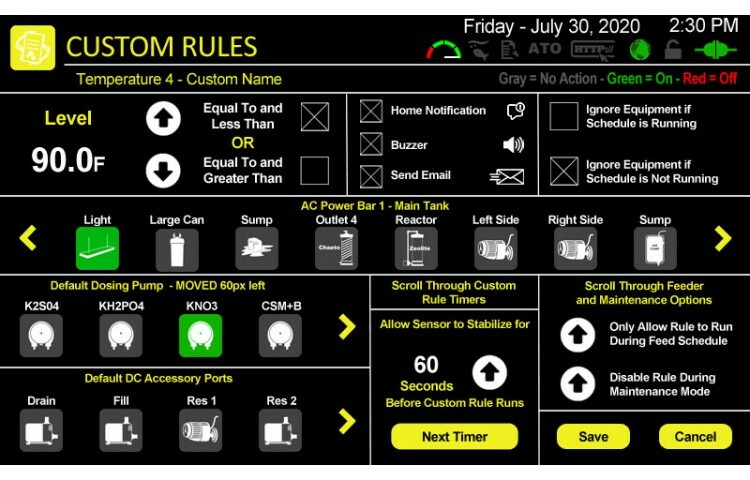 When you access the customs rules page on the controller you are presented with a list of the rules that have been created. 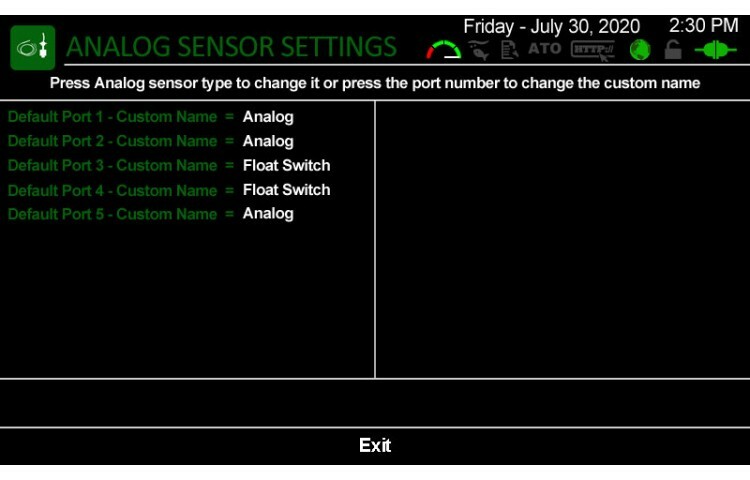 These are sorted by sensor type in the same order as the image. 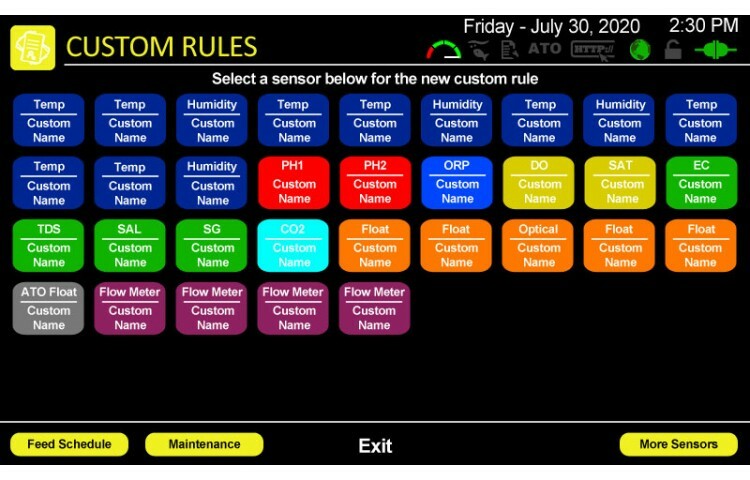 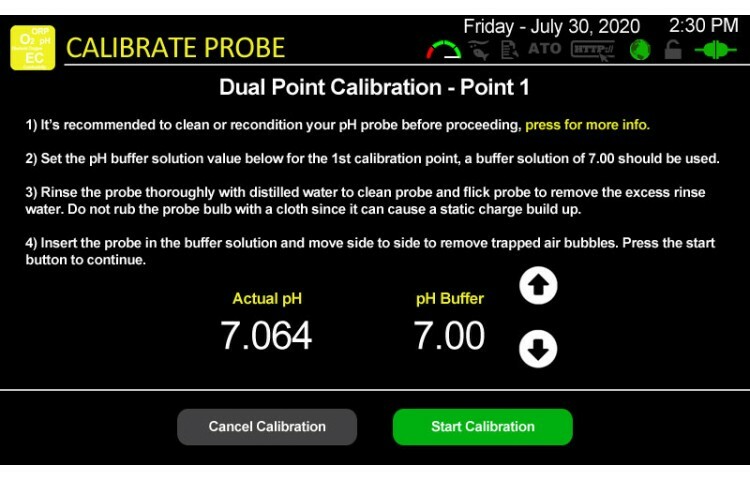 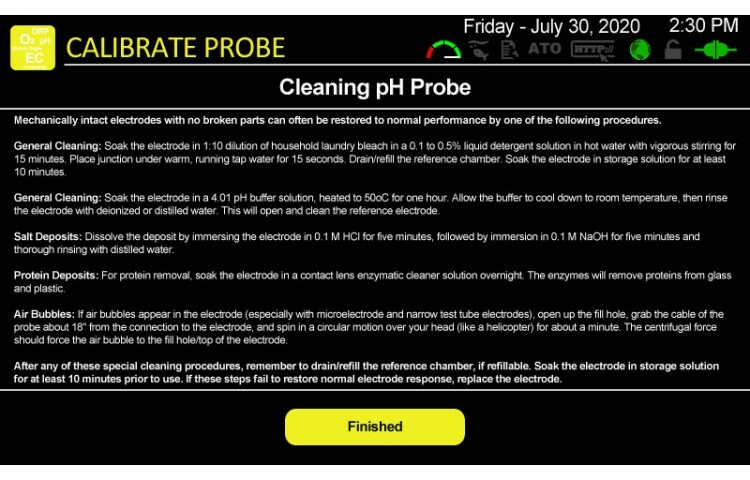 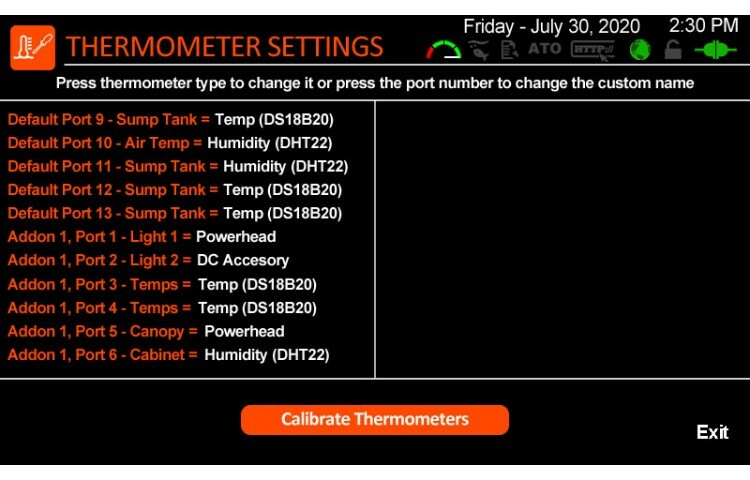 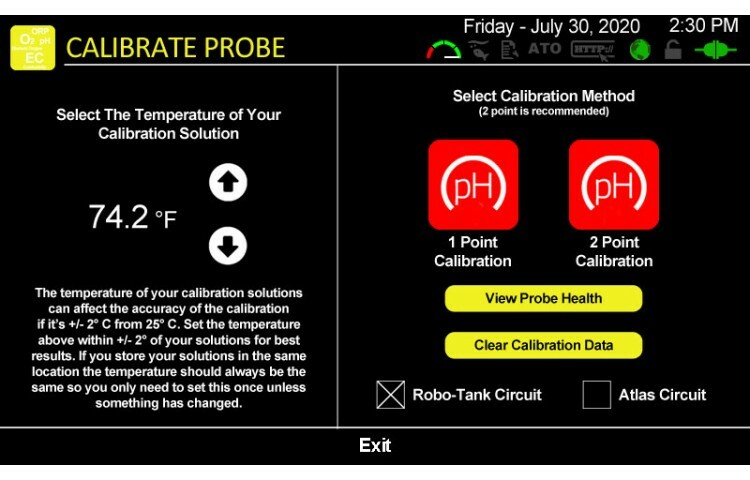 For example all rules related to water temperature will show up first, then air temp, etc... 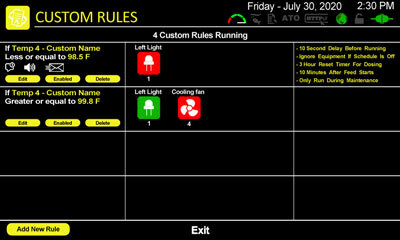 If you need to remove a custom rule simply press the delete button and its gone. 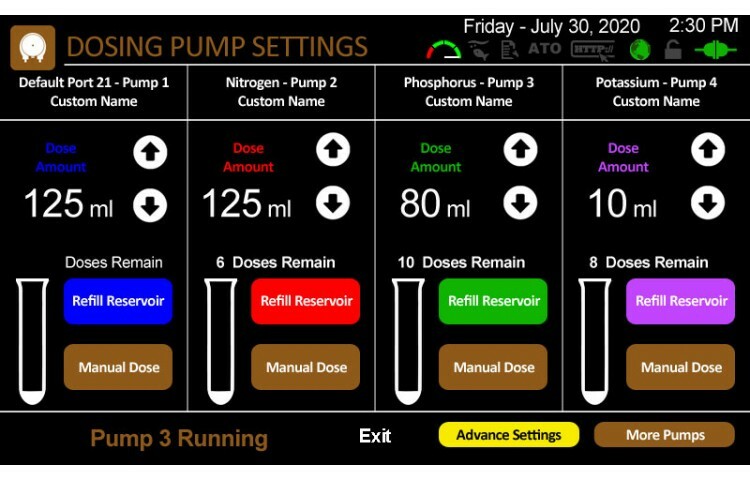 When you create a new rule you can turn an AC outlet on/off, run any dosing pump or control the 4 DC accessory ports. 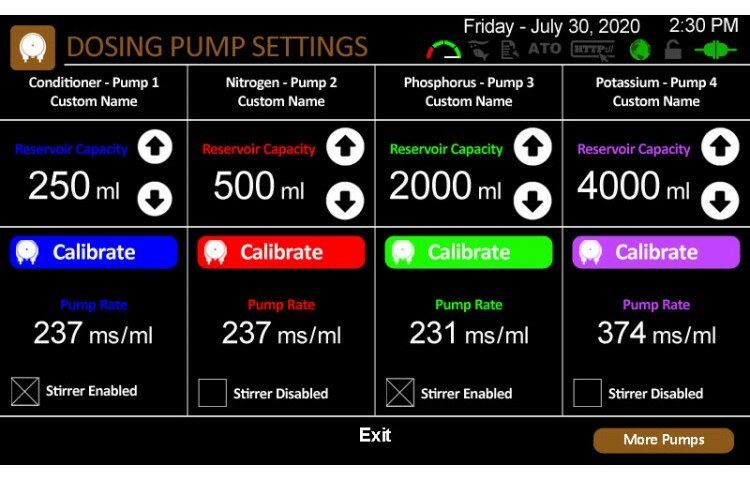 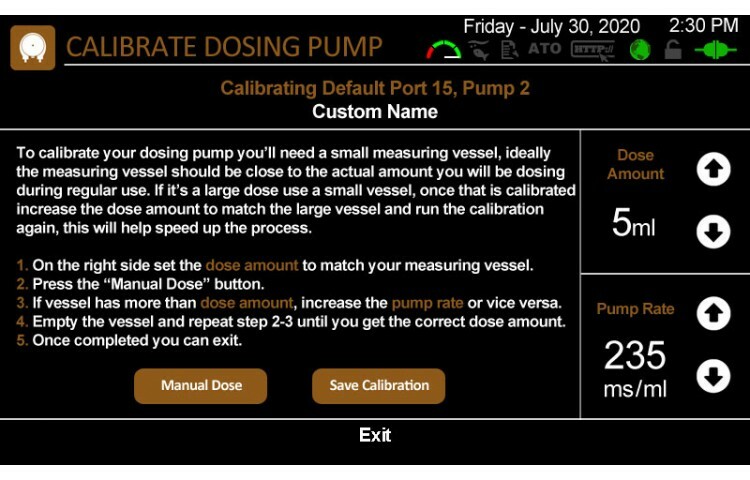 If you create a rule which runs an aquarium dosing pump you can set a timer so that dosing pump never runs again until that time has past. 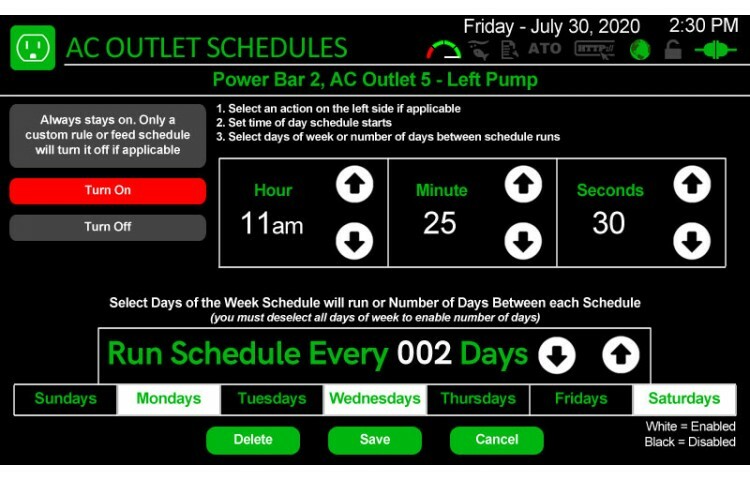 You can also choose to bypass an AC outlet if the daily schedule is currently running or not running. 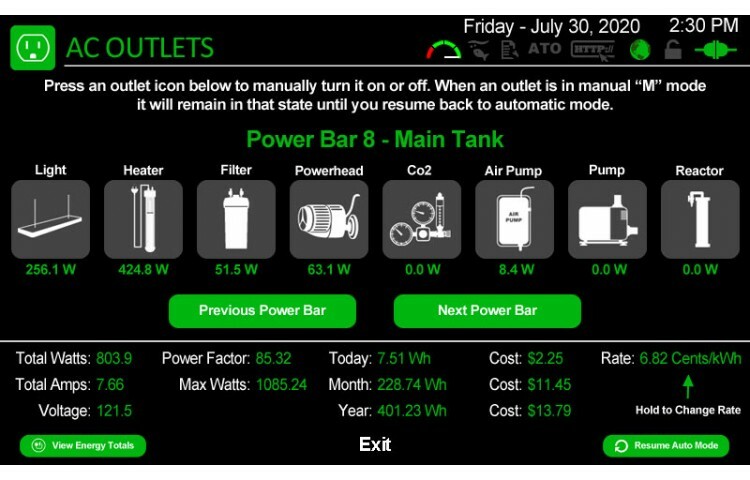 With 16 AC power outlets it can be hard to remember what's plugged in each outlet, if not nearly impossible. 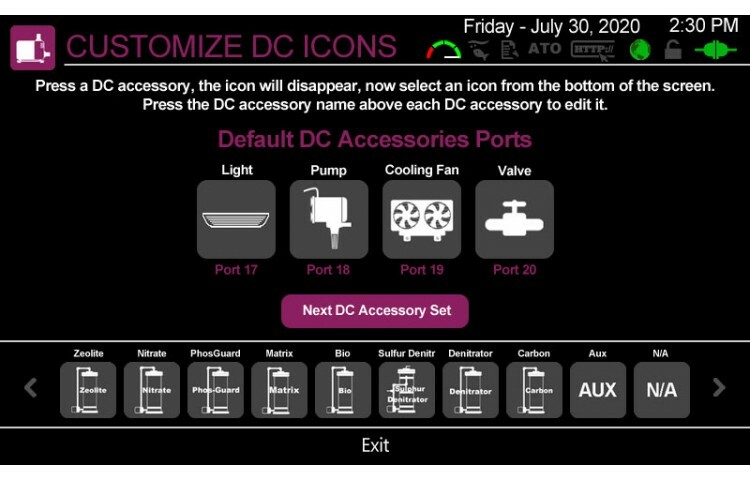 Luckily we have a solution, you can assign any of 10 custom outlet icons to any of the outlets you choose. 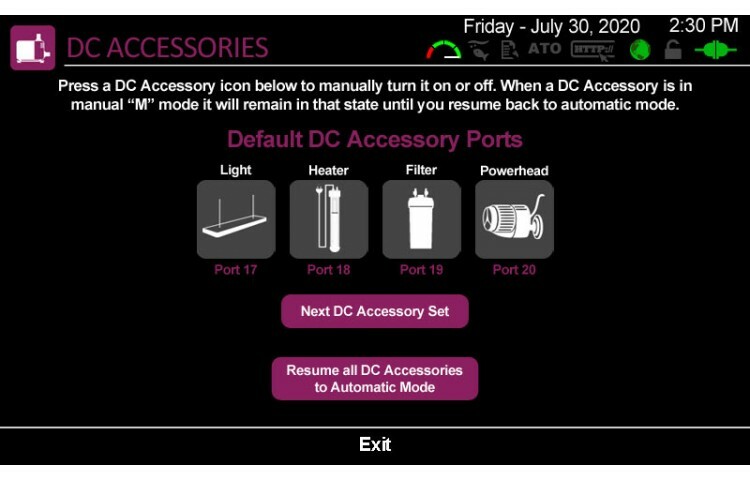 For example, you have a power head plugged into outlet one so you set that outlet as a power head. 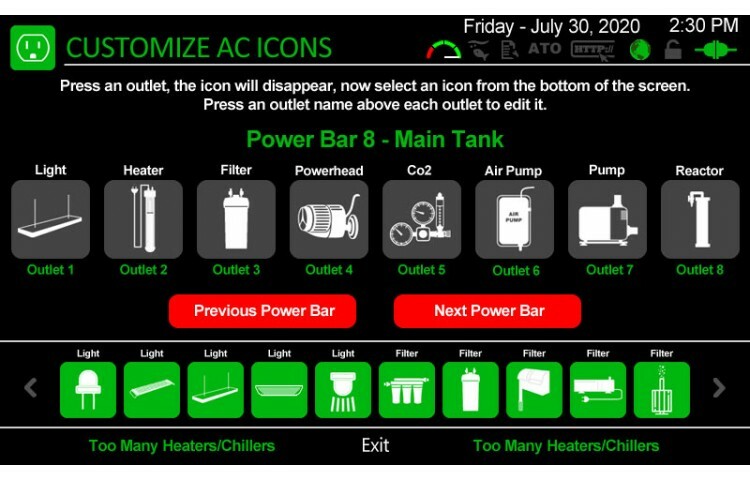 Two months later you decide you want a heater plugged in outlet two, simply change the icon to a heater. 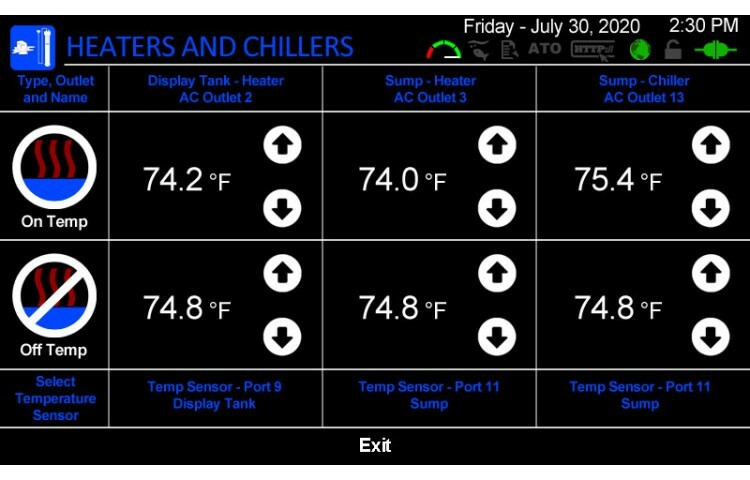 Heater outlets are special because they turn on/off automatically based on a temperature you select, when you move the heater from outlet two to outlet three the controller knows controls that outlet now based on temperature. 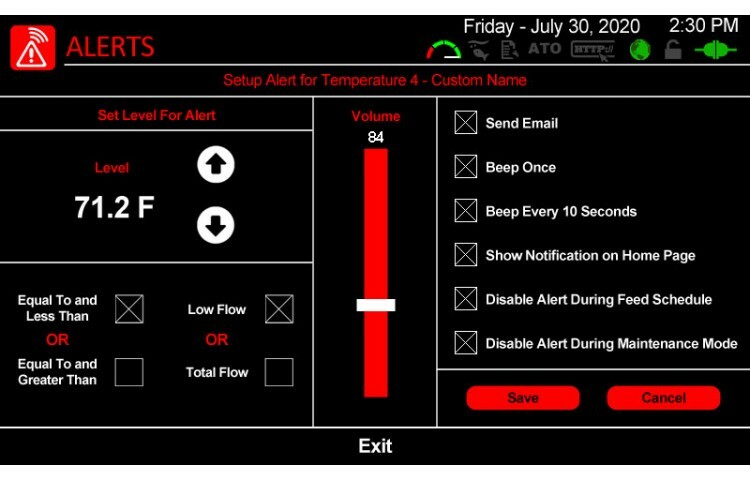 You can plug in two heaters and control each of them independently based on your selected temperature range. 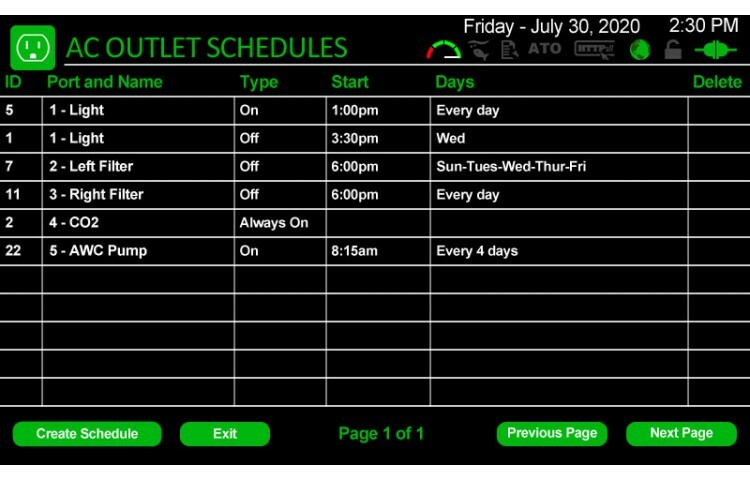 Each outlet has its own on/off schedule, the schedule shows what you have plugged in each outlet so you always know. 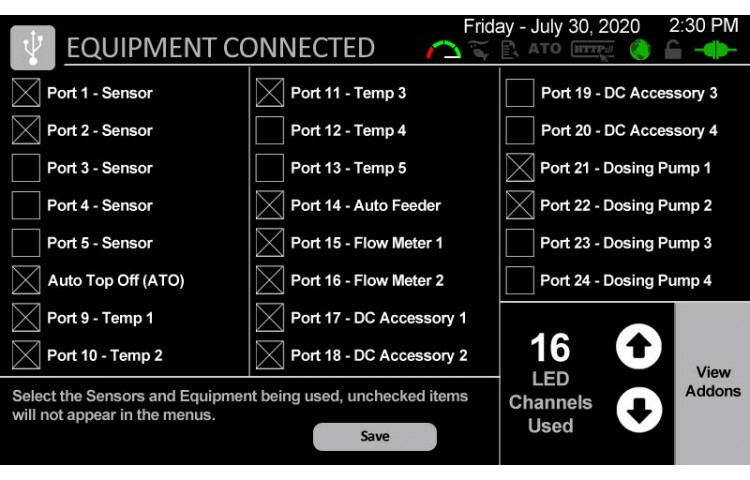 You also have 16 5v PWM LED channels available for your aquarium giving you complete control over your lighting. 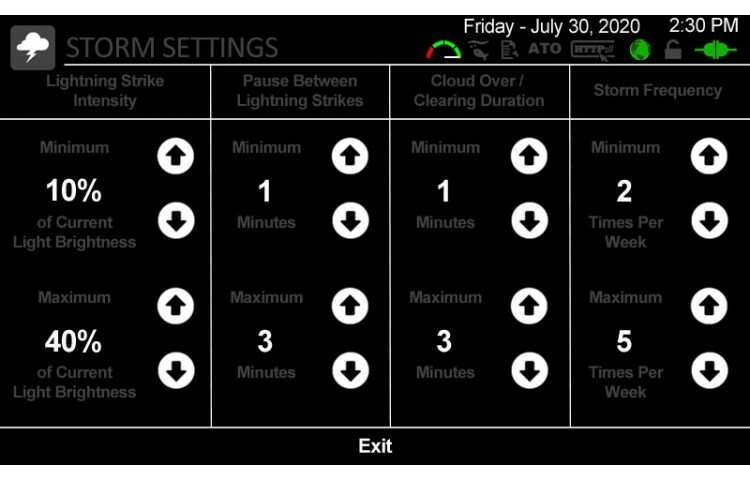 Each channel has 4095 increments allowing you to control the small and large LED with precision. 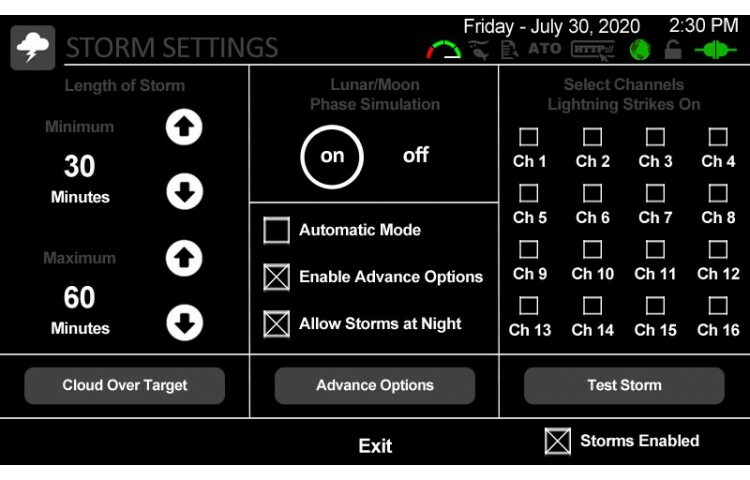 Schedule 6 different fades each day and have the option to run a lunar moon. 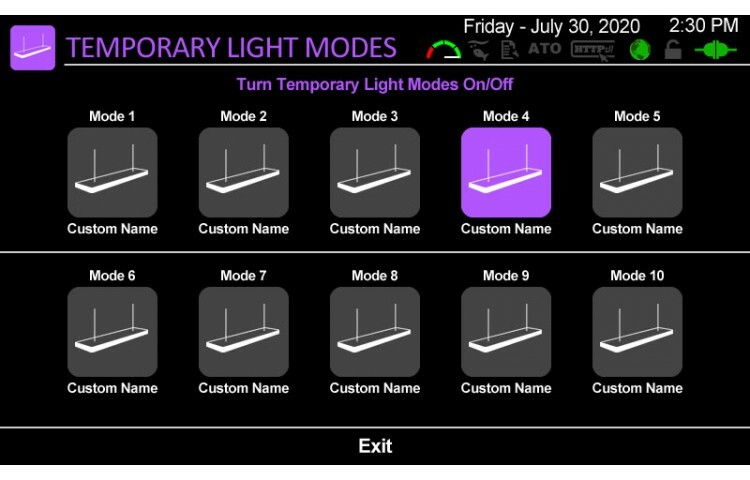 There's also a temporary lighting mode which is great for adjusting the light at any given time without affecting your four regular lighting modes. 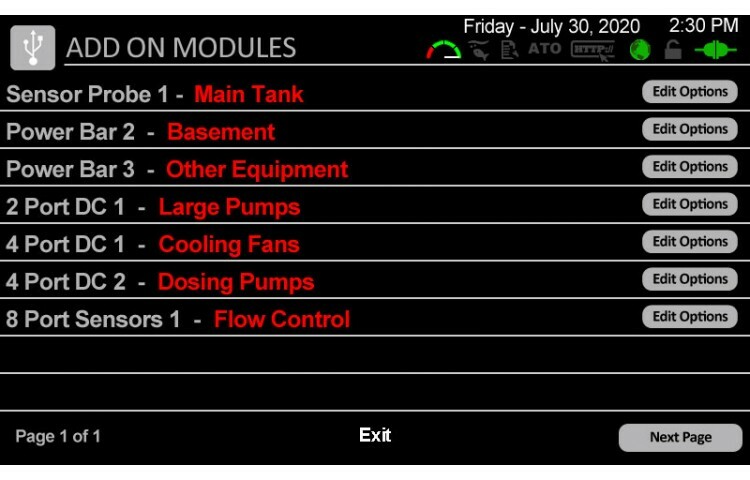 And of course its easy to change the values and see the changes you make because each channel is controlled using a slider. 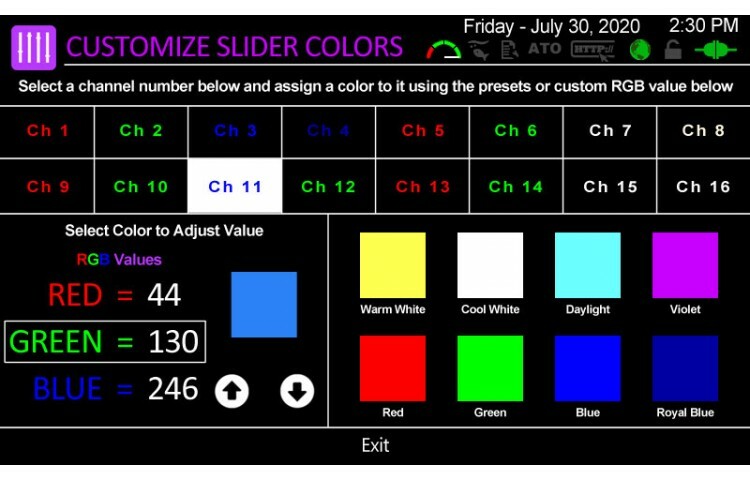 And of course like the power outlets, you can customize the color of each slider so it reflects the LED color on that channel. 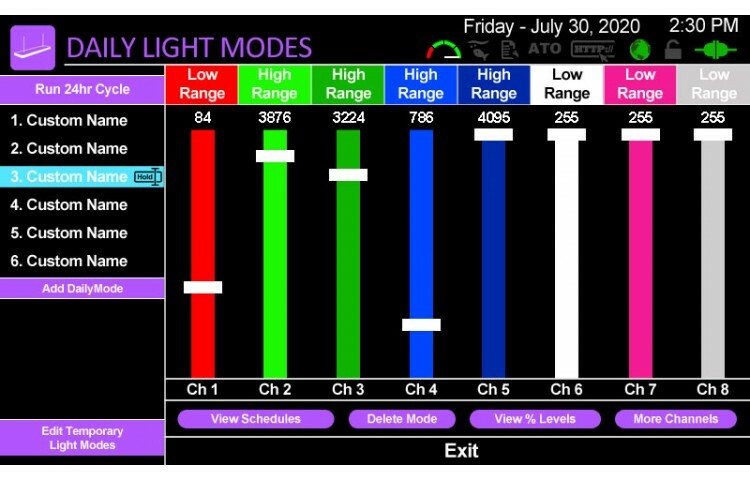 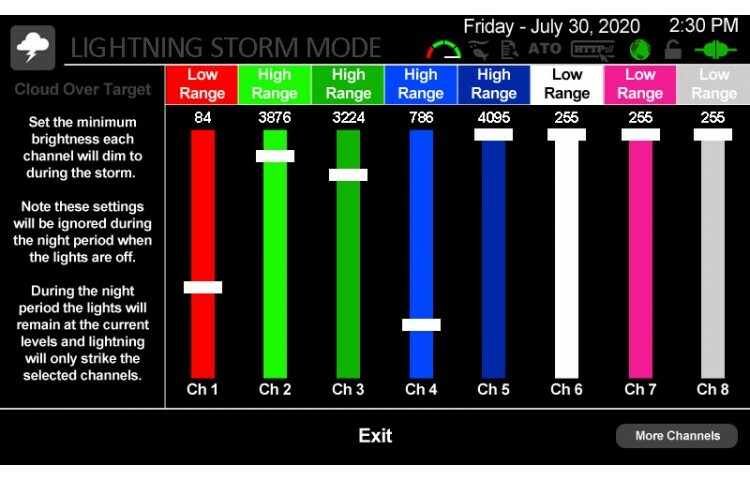 When you update your lighting system change each of the colors on an given channel and see what you control. 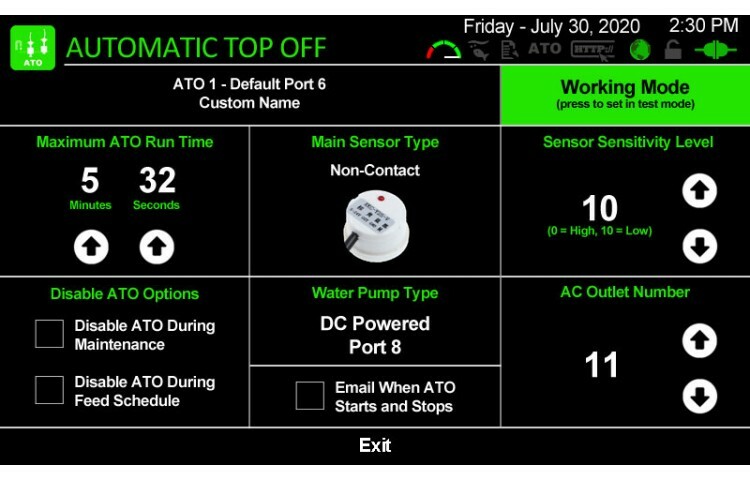 This is a fully assembled Robo-Tank Controller and includes a 7" touch screen, 8 outlet AC Power Bar.. 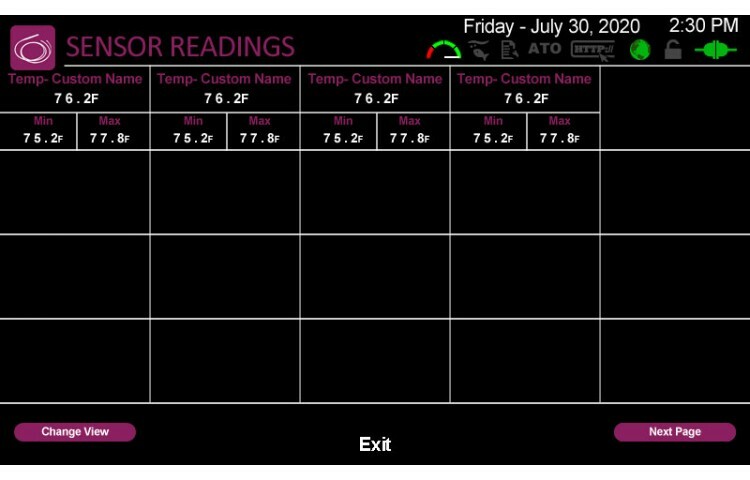 This is a small 5cm x 5cm 8 channel digital to analog converter. 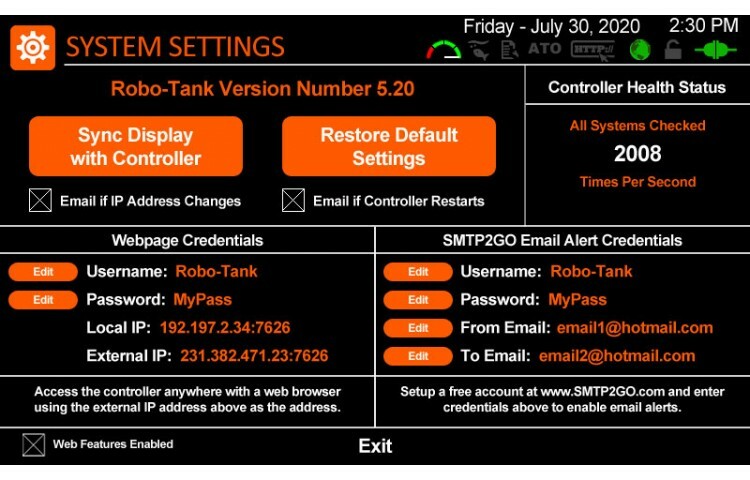 Connect a 5v PWM signal to the inpu..
Never have a flood or let your aquarium level drop with this Automatic Top Off (ATO) system for Robo..